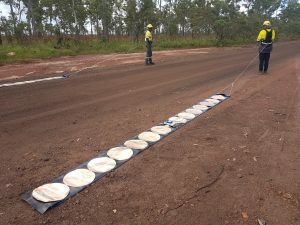 Groundradar continues to develop custom radar instruments and processes for Rio Tinto’s Weipa operations in Queensland, intended to accurately and consistently map the thickness of bauxite atop an ironstone underburden. Groundradar has visited the GEMCO mine in Groote Eylandt to test long-range radar’s ability to map manganese deposits beneath clayey sand. Following from successful tests in 2016, a larger field program at Argyle Diamonds was started by Groundradar and continued by Argyle staff to map paleochannels adjacent to the primary mining operations. Dr. Francke will present a paper entitled “Realistic GPR Performance” at the South African Geophysical Association’s Conference in Cape Town in September. The paper addresses claims made of extraordinary and unrealistic radar performance by some vendors in Southern Africa and Australia using Russian/Ukrainian “megawatt” radars. The paper clearly shows that these performance claims are entirely outside of the bounds of accepted physics and such instruments can pose a significant safety risk.